I want to talk about something I didn’t think I would ever be able to do alone: travel with my two and a half year-old son. Every parent knows how difficult that age can be. But I did it! On a budget, too. Living in Germany has been a gift for my family. We are at a duty station where it is possible to travel to different countries within an hour, depending on your destination. Tons of interesting and unique one-day trips are waiting to be explored, and all the information is available online at the touch of your mouse key. The tough part about traveling as a military family, however, is that dates are rarely set in stone. Soldiers can be called to duty at the last minute, leaving spouses alone at home to plan trips with their kids. Now, you don’t have to be super adventurous and plan trips out of the country. Short day trips to nearby cities work, too. Plus, they build your confidence and prep you for longer, perhaps several-day travels with kids. Either way, the principles for traveling with kids are the same. Here are some tips for your shorter and longer trips with kids. Wherever you go, there is probably a budget airline that can take you there. Prices often change depending on how far out you begin searching for flights. I have found the best time to purchase tickets is 90 days in advance, but no later than 30 days before departure. Some great budget airlines in Europe include RyanAir, Transavia and Wow. But be careful. These airlines have a lot of rules, especially about baggage. It’s important to follow all their guidelines and read the fine print. For example, bigger bags, including strollers, must be checked — and usually for a fee — because budget plans are smaller. Some airlines may allow one carry-on free of charge, but size allowances can be really small. The best tip I can give you here is to read carefully! Airplane staff may welcome travellers with children to board first. Well, my hyperactive little one gets antsy the second his bottom hits the seat and nothing is happening, while we wait for the rest of the passengers to board. So, we board last. 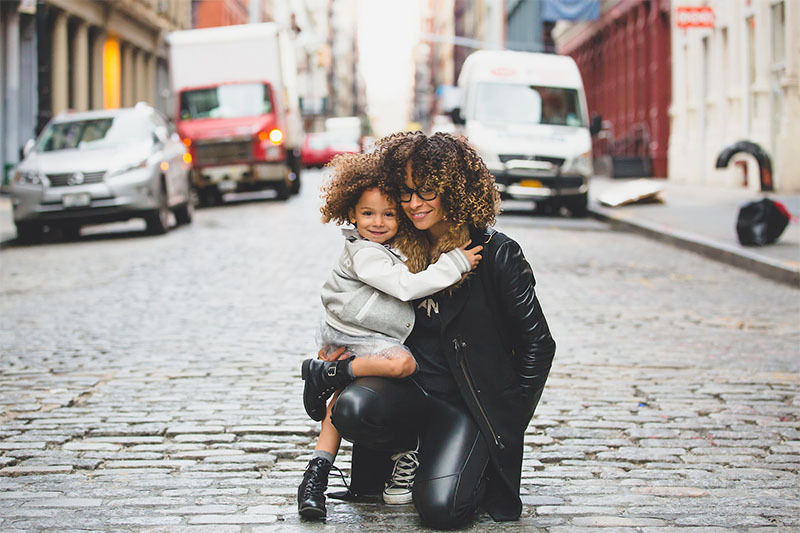 Every moment counts with kids, and it helps moms who are anxious about flying if the amount of time they have to spend inside the enclosed space is minimized. Pack a bag with toys. Depending on your flight destination, you might have a long or short one. Make sure you have enough toys and snacks that are customs approved, like little packets of nuts, dried fruits and cereal in a zip lock bag. It’s also good to bring some formula and liquids, but remember that these items often can’t go past airport security. Believe me, these snacks are life-savers. They can help prevent or sometimes avoid altogether the feared public tantrums. Also, make sure you bring something for yourself: a tablet, book, your knitting kit or something you enjoy. It’s important to bring something that will help you relax and take a little bit of the unavoidable stress of travel off your mind. Baggage is tricky. The key here is to be prepared. Read and re-read the airline’s baggage rules, and know what your entitlements are as a customer. However you choose to pack, I recommend packing more than you think you will need, especially if you don’t know where the closest grocery store is going to be. It’s better to be safe than sorry and over pack, if possible. One checked bag for clothes, including his and mine. A carry-on baby backpack or carrier. A small carry-on backpack, with the electronics and my personal documents, money, etc. As the primary bag carrier on our trips, I have found that fewer bags is better. My back is usually taken, since I carry my son there in a backpack or carrier, so it’s helpful to have as few bags for shoulders as possible. Have your smartphone, instead of a nicer, larger camera, on hand. If you have one, portable chargers are also a great tool to have in your carry-on bag. Using phones as a camera, GPS and messaging device tends to make the phone run out of juice pretty quickly. Carry your wallet, a map of the city, travel documents and other important items in either a carry-on or — admittedly less fashionable — fanny pack. Find ways that make carrying lots of items while travelling easier. Make sure you keep the weight balanced, too. Too much on one side or on one shoulder can be uncomfortable, especially after a while. Don’t go back to the hotel sooner than you want to, simply because you’re carrying too much. The best way to discover a new city is to walk it, explore new and hidden places you may not have found had you not ventured by foot. In my opinion, ensuring your bags are comfortable and space-effective are crucial for a fun trip. If you’re like me, knowing the location of all important buildings and services before the trip is critical. I like to know which stores are close by and which direction to go, especially stores that carry over-the-counter child medication, water and food. Buying these items at the destination instead of bringing them with you can save lots of much-needed traveling space. That’s all the wisdom I have to share for now. I’m still learning! The most important thing is to know that vacationing alone with your kids can be fun. As the old saying goes: you don’t know what you can do, until you try. Even if you spend some time in your hotel room, feet up, resting from all the exhausting walking, it’s still a nice change of tempo and very different than just staying at home. I hope y’all found this helpful. Good luck, and stay safe travelers.